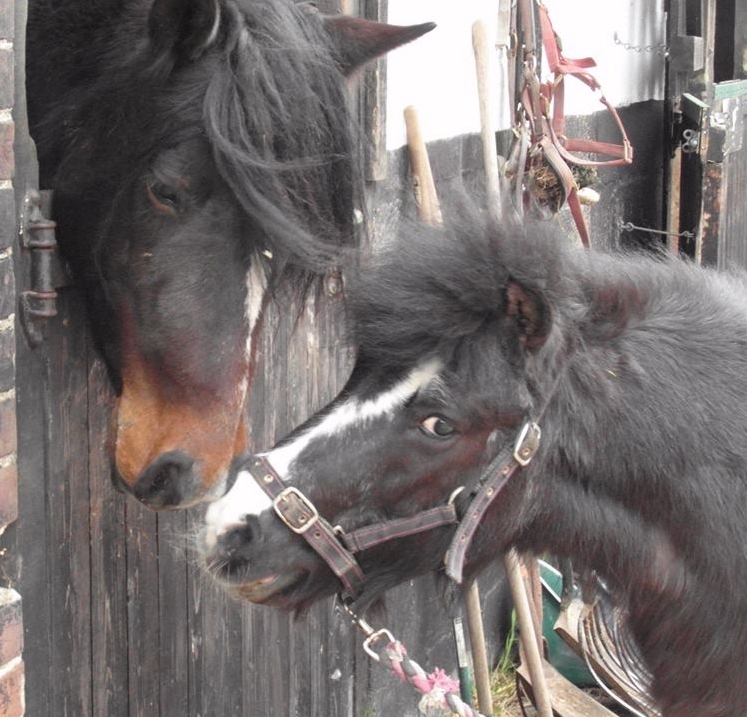 When Nutmeg's owner contacted The Laminitis Site in January 2014, an appointment had been made to have Nutmeg put to sleep the following day - her feet were thought to have been damaged beyond repair by laminitis, she was in a lot of pain and unable to stand for long, vets said nothing could be done. Information on The Laminitis Site helped Nutmeg's farrier carry out a realigning trim, and she started to improve immediately. She was soon happily walking around and going out in a tiny paddock of mud. The photo shows Nutmeg talking to her friend Jenny on one of her walks, exactly 3 months after she should have been put to sleep. 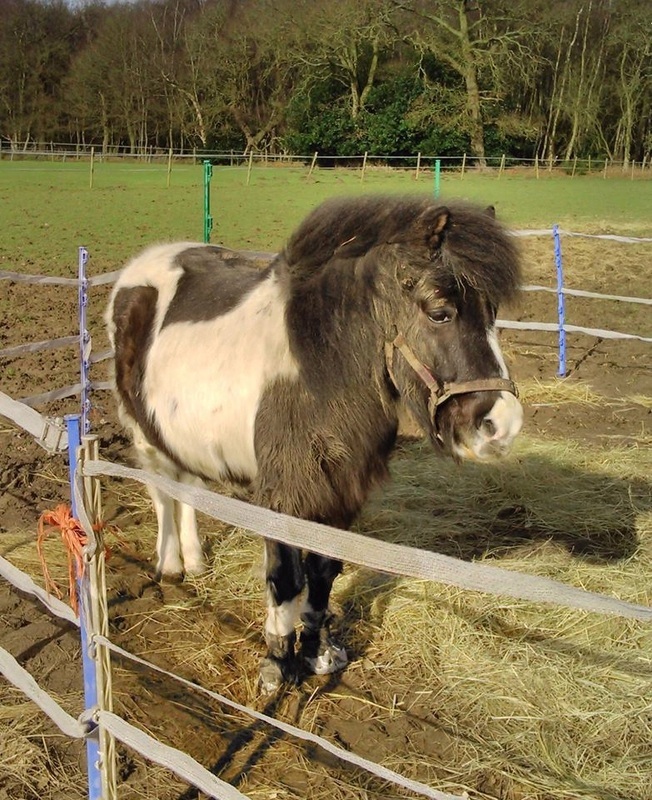 Nutmeg is a 23 year old Shetland with PPID and EMS. When TLS "met" Nutmeg in January 2014 she had had frequent episodes of laminitis and was often footsore and unable to tolerate grass. Her PPID symptoms had recently increased, and it had been suggested that she was given an increased dose of Prascend every other day. This made her very depressed, and her owner was directed to the data sheet for Prascend which indicates that the same dose should be given once daily - Splitting Prascend tablets. In January Nutmeg appeared to develop laminitis again and NSAIDs and ACP were prescribed. On the TLS website her owner found that the use of ACP (a dopamine antagonist) is contra-indicated with Prascend (a dopamine agonist), as it could reduce the effectiveness of Prascend - see ACP. Nutmeg's owner, Laurie, was a member of the EMS, PPID & Laminitis UK Group on Facebook (now superseded by Friends of The Laminitis Site), and on 10 January she posted the question "is 30 degree rotation of the pedal bone and detachment from the hoof wall a hopeless situation? Having to make the sad decision on my pony as she is in so much pain". X-rays had been taken, the first time since 2007, when 21 degrees rotation had been shown. She said she had been told that the pedal bone was nearly through the sole, that one foot would not bear weight, and that there was nothing that could be done, so an appointment had been made for the following day to have Nutmeg put to sleep. Many of Laurie's questions were answered by an article on the TLS website: FAQ: Rehabilitating the feet after laminitis. The article explained that rotation can nearly always be corrected, even rotation of 30 degrees, and pointed out the risks of not carrying out a realigning trim. The situation was complicated by the fact that Nutmeg had a raised temperature, was lying down most of the time, not eating, and was being treated with antibiotics. Nutmeg's feet hadn't been trimmed for 10 weeks because she had been in pain. Late that night photos were taken of her feet and posted on the support group. 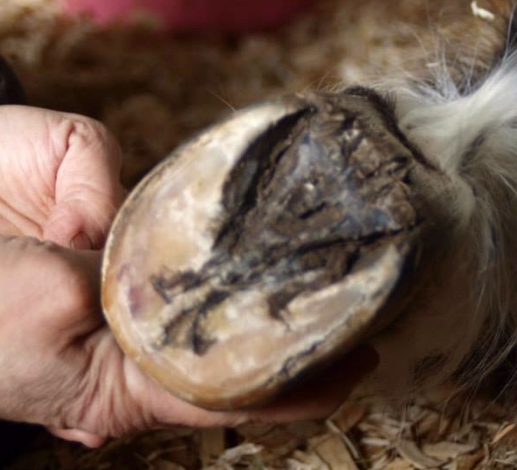 The photos showed long toes and high heels on her front feet, with divergent hoof rings suggesting that she had had chronic laminitis for months. However, a change of angle in the hoof wall suggested that the new growth beneath the coronet was correct and connected to the pedal bone, and gave a guide for breakover for the suggested realigning trim. 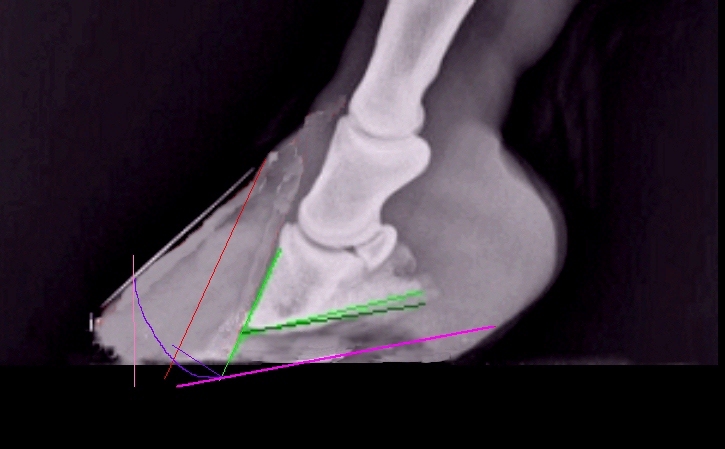 A change of angle (orange), with correct new growth beneath the coronet (red) projected to ground level suggesting the correct toe line. Divergent hoof rings (white) suggest a long history of chronic laminitis. 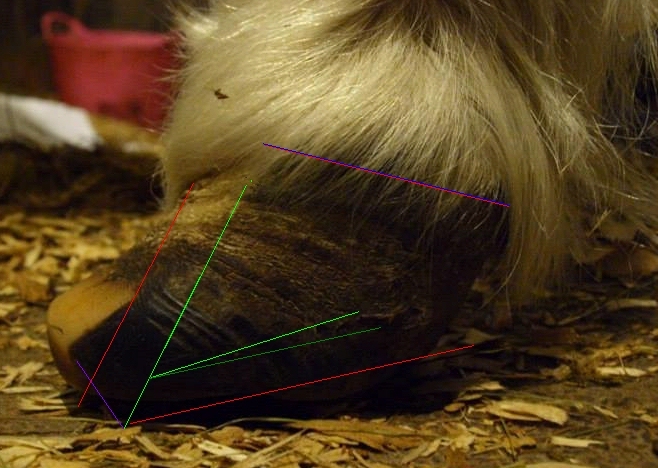 Using the new growth at the coronet, the hairline angle and collateral groove depths, the position of the pedal bone could be estimated (green) and an approximate trim guide drawn onto the hoof, which was confirmed by x-rays. 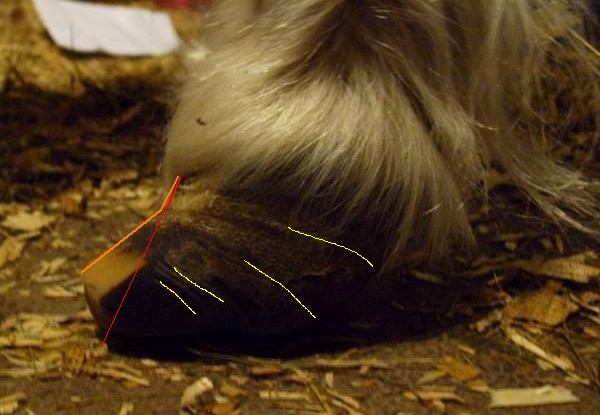 Although a systemic infection could cause SIRS laminitis, the "writing on the wall" of Nutmeg's feet suggested that this was most likely chronic endocrine laminitis, and as long as she could be kept stable, there seemed little to lose in carrying out a correct realigning trim to see if that improved her comfort. The following day Laurie received the x-rays, which showed a huge laminar wedge, palmar angles of over 20 degrees and some bone remodelling on both fores, but there was plenty of sole depth and no gas pockets to suggest total separation of the laminae. The middle section of the hoof wall at the toe made a 30 degree angle with the pedal bone, but Nutmeg's farrier had already brought the breakover back behind this and new hoof growth at the coronet was following this line, making this angle less important (this illustrates the importance of using barium paste to mark the hoof wall for x-rays, so that all changes in the contours of the hoof wall can be taken into account when calculating changes due to laminitis). The euthanasia appointment was cancelled, and the farrier agreed to come out that day to trim Nutmeg's feet. With trim guidance from the TLS website (particularly Dorsal rotation/long toes and High heels), Nutmeg's farrier carried out a good realigning trim, bringing the heels back to the widest part of the frog, bringing breakover further back and bevelling the walls to remove them from weight bearing. EVA pads were fitted to protect and support Nutmeg's feet. The following day Laurie reported: "when I got down there this morning she was standing there and greeted me with a whinny". Although she was still sore on her right fore, Nutmeg was standing much more, starting to eat and pass dung again, and her temperature was returning to normal. Nutmeg's feet were trimmed again a few days later, and kept protected and supported with a deep shavings bed and EVA pads. "I don't know if it is a combination of her good trimming and always wearing her soft boots across the yard but she is full of beans. I am trying to walk her calmly and she is jumping up in the air on all fours, bucking and walking out a lot quicker and easier than she has done in a long time. Great to see her like that but also fretting about her damaging her feet by being such a loony! Even on a sachet of Danilon a day she used to walk slower than she has been these last few days". In April Laurie posted a photo of Nutmeg talking to one of her friends on her daily walk, 3 months to the day that the vet had recommended she was put down. "We have a few ups and downs especially on her front foot which is the worst but this is mainly due to the fact that when she is feeling 100% she insists on being silly and jumping in the air on all fours and bucking, forgetting she is not as young and as agile as she used to be. I turn her out for about 45 minutes a day in the mornings in a small bare paddock and take her for a short walk of about 5 minutes in the afternoons. I am having the farrier every 4 weeks to help with her remedial trimming. She is still getting used to her new boots which she has only had a few days as previous to that she was in soft boots. We have all concrete in the yard and boggy land that turns rock hard and lumpy when its dry so it can be a challenge finding suitable places to walk her. As long as she is happy that is enough for me."